Produced and Mixed by Mike Denneen at Q Division, Sommerville, MA. Executive Producer : Wayne Sharp. Recorded by Matt Beaudoin, assisted by Matt Tahaney. Additional engineering by Matt Tahaney and Mike Denneen. Mastered by Andy Van Dette at Masterdisk. "KISS frontman Paul Stanley has collaborated with Boston-based THE CLICK FIVE on the track "Angel to You (Devil to Me)", which is set to appear on THE CLICK FIVE's debut CD, "Greetings From Imrie House", due on August 16 via Lava Records. Stanley reportedly co-wrote the track with THE CLICK FIVE keyboardist Ben Romans at Stanley's home studio. The song also features a guest appearance by Elliott Easton of THE CARS. 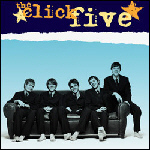 THE CLICK FIVE, which bills itself as a power pop quintet "on par with CHEAP TRICK and MATTHEW SWEET," has sold over 10,000 EPs in a few short weeks on tour and has experienced countless tales of fan frenzy at their after-show signings, according to SILLive.com. THE CLICK FIVE's first single is "Just The Girl" (May 23, 2005).